From visas to vegetation here is everything you need to know before embarking on your unforgettable Chobe adventure. There are a numbe of different gates where you can pay your park fees and enter the park. The main entrance is at Sedudu Gate in the north-east of the park near the town of Kasane. Then there is Ngoma gate near Namibia, which can be accessed by the public road that runs for 54 kilometres through the park and is used by visitors from Namibia and thos stating in the Chobe Enclave. The southern entrance to the park is at Mababe gate along a route that connects with Moremi Game Reserve. This gate is 56km south of Savute. Perhaps first and foremost among the risks to consider when visiting Chobe is malaria. Chobe lies in a malaria belt and it is recommended to take prophylactics while staying in the area, particularly in the late rainy season – roughly from January to April. Even if taking prophylactics, it’s still advisable (for the sake of a good night’s sleep if nothing else) to always use repellent and to wear long sleeves and trousers after dark. At the first sign of malaria symptoms be sure to take a malaria test (available from most pharmacies). Symptoms include: aches, chills, headaches and fever, muscle pains, nausea and diarrhea. Consult your nearest doctor or travel clinic at least a month before heading to Chobe for advice regarding prophylactics and malaria precautions as well as any vaccinations you might require for Botswana or other parts of the region that you might be visiting. Though Botswana is a yellow fever-free zone (as are most of its neighbours), if arriving in or returning to Botswana from a yellow fever zone, you will be asked to show a yellow fever vaccination certificate. If you require this vaccination, you should have it done at least two weeks before your trip. For a full list of countries that require a yellow fever vaccination, click here. It’s generally safe to drink the water in Botswana, and be sure to drink lots of it to avoid dehydration as the heat in Botswana can be intense. There is a private clinic in the town of Kasane on the edge of Chobe and most lodges can organize on site medical treatment. Holders of most European passports do not require a visa to enter Botswana for up to 90 days. The same goes for US citizens as well as South Africans and most other SADC passport holders. For those passport holders that do require a visa to visit Botswana, find your nearest Botswanan Embassy or Consulate here for more details. Visa applications should be made at least four weeks before your departure. In some instances visas can be issued at the Botswanan border if pre-approved by Botswanan immigration services. NOTE: Most foreign nationals planning to also incorporate Victoria Falls into their trip (either the Zimbabwean or Zambian side) will require a visa for this. 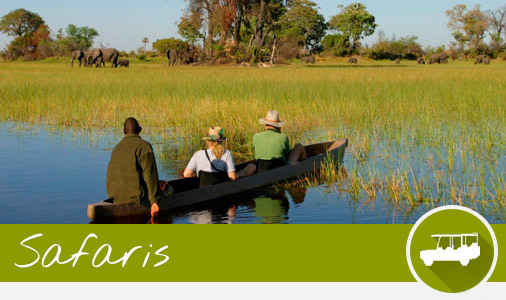 Click here for full details on Zambian visas and for Zimbabwean visas. Most visitors to Chobe National Park will have to come through the town of Kasane, whatever mode of transport they choose. For those that are self-driving, roads in Botswana are generally pretty good and heavy traffic will certainly never be an issue! If coming from Johannesburg, it’s a 1300km drive via Francistown and Nata. Cross the border at Martin’s Drift and carry on straight through to Francistown, then the A3 runs from Francistown to Nata, then from Nata you take the A33 all the way through to Kasane. If driving across the border from the Zambian side of Victoria Falls, you can take the ferry over the river at the Kazangula border. You get to the border via the M10 from Livingstone. It’s a little less than 80kms and should take about 1hr 45mins. It’s a similar distance but usually a little quicker from the town of Victoria Falls in Zimbabwe. This route takes you through Zambezi National Park and into Kasane on the A33. Kasane also has a small but surprisingly busy international airport. Air Botswana provides scheduled services between Gaborone and Kasane. SA Airlink also flies between Johannesburg and Kasane. There are two distinct seasons in Chobe National Park, and both offer a very different but equally spell-binding safari experience. The rainy season runs roughly from November through until the end of March and brings with it average temperatures of 350 to 400 Celsius in the day and a balmy 250 or so at night. The rain usually falls in the late afternoon and evening, so most of the day remains dry and the humidity is not too oppressive despite the heat. The dry season runs roughly from April through until October and average daytime temperatures are a much more manageable 27o or so, though they start to rise fairly quickly in October before the onset of the rains. At night in the dry season it can get quite chilly. If setting out on early morning game drives at this time of year, be sure to wrap up warm. The rainy season is the best season to experience Chobe’s spectacular birdlife in all its glory, and the lush, green vegetation is stunning; this season also brings with it the Savute zabra migration. The dry season is the best time of year to see huge herds of Chobe’s famous elephants in the Chobe River, as well as equally vast herds of buffalo and the park’s many predators, all of which are drawn to the river’s banks. The rich ecosystems of Chobe National Park lend themselves to an astonishing diversity of flora and fauna, as well as an array of stunning landscapes, all of which ensure a safari experience like no other. Chobe National Park is blessed with an amazing abundance of wildlife. Chobe is particularly feted for its unparalleled Kalahari elephant population (there are around 120,000 elephants in the park), which are often found in herds of more than a hundred. Buffalo can be easily found in equally large herds, while the river is home to a great number of hippos. Sticking with the bigger mammals, there are plenty of giraffe around too. Chobe is also famous for its considerable lion population, and the lion’s age-old archenemy the spotted hyena is found throughout the park as well. Leopard are often found in the forested riverine areas, and cheetah and the endangered African wild dog in the more open grassland areas around Savuti. Chobe is home to a few species of rare semi-aquatic antelope: puku, red lechwe and sitatunga. A total of 19 species of antelope can be found throughout the park, as well as large numbers of Burchell’s zebra. There are a number of smaller mammals about too, including warthog, baboons, cheeky vervet monkeys, honey badgers, mongooses, jackals and even the rare pangolin to name but a few. Of the reptiles in Chobe, crocodiles are surely the most evident, whilst there is also a good chance you’ll see large water monitor lizards around too. Chobe boasts an incredible 450 species of bird, most of which are best seen on a boat cruise down the river. To name but a few of the best offerings, you are likely to find giant kingfishers, green-backed herons, pied kingfishers, white-fronted bee-eaters, carmine bee-eaters African fish eagles, grey-headed gulls, great white egrets as well as much sought after rarities such as the malachite kingfisher and the African skimmer. Chobe is also home to various different types of vulture as well as the famously strange-looking Marabou stork. Chobe is a birder’s paradise. For photographers, bring a big lens with you and you’ll be sure to take the best bird images of your life. The Serondala area or Chobe riverfront is characterized by lush floodplains and dense woodland of mahogany, teak and other hardwoods. This riverine section and the floodplains sustain a rich variety of habitats vital to the multitude of animals that inhabit Chobe. The Savuti Marsh is constitutes the west of the park and is characterized by open grasslands and savannah woodland. This was once a large inland lake. Today, it is fed by the erratic Savuti Channel which is dry for long periods then suddenly decides to flow again as a result of tectonic activity in the area. This unreliable water supply has resulted in a number of ghostly dead trees that dramatically intersperse the otherwise open landscapes. Wildlife is very diverse here and it is often the best region to find the park’s predators, as well as the annual migration of zebras. The Linyanti Swamp and Wetlands is found in the north-west corner of the park and the region’s lagoons and floodplains are complimented by the distinctive surrounding riparian woodlands, consisting primarily of sausage trees and jackal berry, as well as large palms and papyrus. Between the Savuti Marsh and Linyanti you’ll find the hot, dry hinterland section consisting mainly of the Nogatsaa grass woodland. This area is the wildest and least-explored in the park, and is home to large herds of eland.